Sarah Catharine Holcombe was born on 21 September 1862 at Hartford, Hartford Co., CT. She was the daughter of James Huggins Holcombe and Emily Merrill Johnson. Sarah Catharine Holcombe died on 12 February 1874 at Dresden, Germany, at age 11. She was buried on 24 May 1874 at Spring Grove Cemetery, Hartford, Hartford Co., CT.
After a sickness of eight weeks, "Kitty" as she was called, died while with her family on their European trip. Her father returned for the funeral held at 87 Elm Street, Hartford, the home of Charles W. Johnson, brother of Emily Merrill Johnson Holcomb. Her middle name is spelled Catharine in the family bible and Catherine in the cemetery. Harvey Bates Elmore was born on 2 February 1806 at Cambridge, Lamoille Co., VT. He was the son of Dr. Nathaniel Elmore and Lucy Harvey. Harvey Bates Elmore married Nancy Smith Holcombe, daughter of Phinehas Holcombe Jr. and Nancy Smith Huggins, in 1831. Harvey Bates Elmore died on 21 March 1883 at Winsted, Litchfield Co., CT, at age 77. He was buried at Central Cemetery, Winsted, Litchfield Co., CT. In 1831 he married Nancy, daughter of Phinehas Holcomb (Jr.) of New Hartford by whom he had three children - two daughters died in childhood, and a son, Edwinharvey, was killed at Antietam, aged 26. His first wife died in 1846, and in 1851 he married Mrs. Harriet Mallory Hubbard, by whom he had one son, Charles Mallory Elmore, who survives him and who was his devoted nurse. Mrs. Elmore died in 1858., Mr. Elmore's health had been declining for several months, but his last illness was about three months duration, during which his mental facilities became impaired, and he was a great sufferer. Mary Jane Elmore Elmore was born in 1832 at probably New Hartford, CT. She was the daughter of Harvey Bates Elmore and Nancy Smith Holcombe. Mary Jane Elmore Elmore died on 29 October 1834 at New Hartford, Litchfield Co., CT. She was buried at Village Cemetery, New Hartford, Litchfield Co., CT.
Harvey Edwin Elmore (sometimes known as Edwin Harvey) was killed at the battle of Antietam, Maryland; he was in Company C as was hi Uncle, Hubert F. Holcomb. I have been searching to ascertain for sure the place of his burial ever since 1973; in the May 26 edition of the New Hartford Tribune; "Graves of soldiers in the different cemetery in New Hartford: North Village Cemetery - First Sargeant Edwin Harvey Elmore, Co. C, 8th Conn. vols. Killed at Antietam, Sept 17, 1862." Does this statement prove beyond a doubt that the U.S. marker is a gravestone rather than a cenotaph? The Civil War memorial monument lists: 8th Conn. Infantry: Harvey E. Elmore and Hubert F. Holcomb. Harvey Edwin Elmore was born on 22 February 1836 at New Hartford, Litchfield Co., CT. He was the son of Harvey Bates Elmore and Nancy Smith Holcombe. 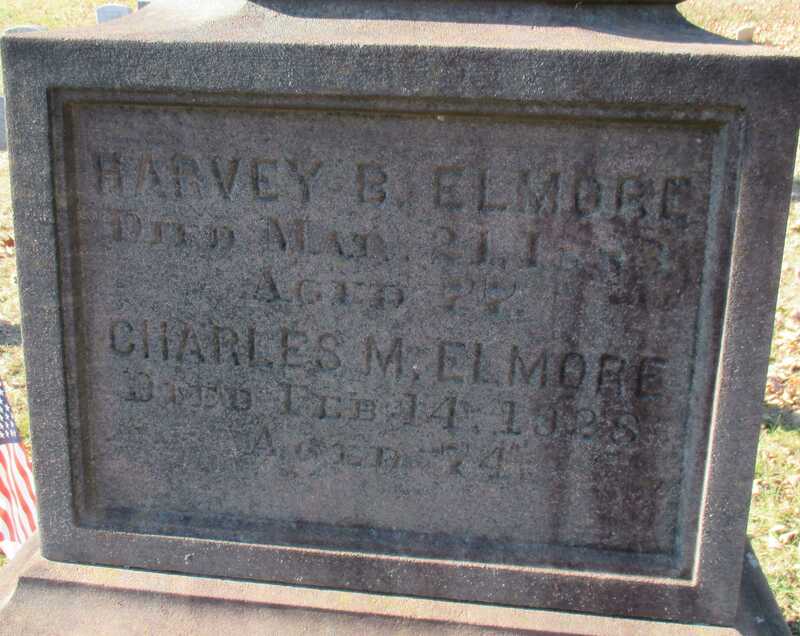 Harvey Edwin Elmore died on 17 September 1862 at Antietam, MD, at age 26. Nancy Smith Elmore was born in 1838 at probably New Hartford, CT. She was the daughter of Harvey Bates Elmore and Nancy Smith Holcombe. Nancy Smith Elmore died on 6 October 1838 at New Hartford, Litchfield Co., CT. She was buried at Village Cemetery, New Hartford, Litchfield Co., CT.
Mary Byrne was born on 4 June 1817 at New York. She married Charles Nelson Holcombe, son of Schuyler Holcombe and Huldah Crow, on 1 February 1837. Mary Byrne died in 1849 at New Haven, CT.
Mary Elizabeth Holcombe was born on 4 January 1838 at New York. She was the daughter of Charles Nelson Holcombe and Mary Byrne. Catherine F. Holcombe was born on 27 March 1840 at Chicago, IL. She was the daughter of Charles Nelson Holcombe and Mary Byrne. Catherine F. Holcombe was born on 29 March 1840 at Chicago, IL. Julia Huldah Holcombe was born on 9 September 1841 at Chicago, IL. She was the daughter of Charles Nelson Holcombe and Mary Byrne. Julia Huldah Holcombe died on 8 January 1908 at Mashapaug Park, CT, at age 66. She was buried at Stafford Springs Cemetery, Stafford, CT.
Emily R. Carpenter was born on 2 January 1832 at Coventry, Tolland Co., CT. She married Henry R. Holcombe, son of Friend Holcombe and Lydia Roberts, on 5 June 1854 at New Hartford, Litchfield Co., CT. Emily R. Carpenter died on 25 September 1882 at New Hartford, Litchfield Co., CT, at age 50. She was buried at North Village Cemetery, New Hartford, Litchfield Co., CT.
Gertrude M. Brown was born on 15 February 1844 at Great Barrington, Berkshire Co., MA. She was the daughter of Robert M. Brown and Lydia (?) Gertrude M. Brown married Henry R. Holcombe, son of Friend Holcombe and Lydia Roberts, on 2 October 1883 at New Hartford, Litchfield Co., CT. Gertrude M. Brown died on 17 February 1923 at 400 Washington St., "Missing Place" no. 5164, at age 79. She was buried at North Village Cemetery, New Hartford, Litchfield Co., CT.
Lucretia Hull was born on 23 May 1840 at Cornwall Hollow, CT. She was the daughter of Ransley Hull and Amanda Buler. Lucretia Hull married Robert Lloyd Holcombe, son of Friend Holcombe and Lydia Roberts, on 13 November 1860 at New Hartford, Litchfield Co., CT. Lucretia Hull witnessed the adoption of Charles Frederick Holcombe. Lucretia Hull died on 4 January 1899 at Main St., Southington, Hartford Co., CT, at age 58. She was buried at Quinnipiac Cemetery, Southington, Hartford Co., CT.
Amanda Buler was born at Canaan, Litchfield Co., CT.
Charles was a lawyer, Bridgeport, CT. Served as Sec.-Treas. of a rubber manufacturing company; engaged in banking by 1890; prospered, owning a valuable home there. By the enumeration of the 1920 Fairfield Co., CT, federal census, he was President of the rubber manufacturing company (ED 26, page 7A). He was 53, Rose was 48, Robert was 15. Charles Frederick Holcombe was born on 9 March 1866 at Barkhamsted, Litchfield Co., CT. He was adopted. He was the son of Robert Lloyd Holcombe and Lucretia Hull. Charles Frederick Holcombe married Rose Wedin on 12 December 1900. Charles Frederick Holcombe died on 20 June 1958 at Bridgeport, CT, at age 92. He was buried at Quinnipiac Cemetery, Southington, Hartford Co., CT.
[S25] Hannah McPherson, Holcombe Genealogy, Pge 124.2/Item A-8-1-2-6-4-7-8-3. Merton R. Holcombe was born on 20 April 1870. He was the son of Robert Lloyd Holcombe and Lucretia Hull. Merton R. Holcombe died on 17 October 1930 at Hartford, Hartford Co., CT, at age 60. He was buried on 20 October 1930 at Quinnipiac Cemetery, Southington, Hartford Co., CT.
Meron r. Holcomb, 60, of 16 Allen Place died at the Hartford Hospital, Friday. Mr. Holcomb was manager of the production department of the Royal Typewriter Company and had been connected with the company for the past 12 years. He leaves one brother, Charles Holcombe of Bridgeport. The funeral will be held Monday at 2 p.m., with services at the Quinnipiac Chapel, Plantsville. Rev. George H. Gardner, pastor of the Plantsville Baptist Church will officiate. Burial will be in the Quinnipiac Cemetery, Plantsville. Merton's will, recorded in Volume 122 at page 214 of the Hartford Probate Court, states he is "of Hartford", directs his executor to bury him "beside my first wife in Quinnipiac Cemetery, Southington"; gives $5,000 to Mae G. O'Loughlin Fallone, 1041 Capitol Avenue, Hartford for her help in his business, $5,000 to Florence N. Graves, 433 Albany Avenue, Hartford for her services as a nurse. All the rest both personal and real estate divided into two equal parts: one part to Annie Cowles Turner, sister of his first wife......both of Plantsville. If Annie Turner should not survive, her share goes to O'Laughlin and Graves equally. If Harriet Camp does not survive, one part goes to her son Rudolph Camp, the other part ot O'Loughlin and Graves. The last paragraph states, "I make no provision for my wife Caroline Holcomb for the reason that she deserted me and my home in 1911 and her whereabouts is unknown to me." The will is dated September 12, 1930 and names the City Bank, Hartford as executor. Later Caroline appeared, contested the will and the $150 per month which the court awarded her; she finally settled for a lump sum of $3,000. Her address was 1445 South Salina Street, Apt. 16, Syracuse, New York. Merton probably had no children. In 1891 and 1892, a Merton Holcombe was recorded in the city directories of Rockville, CT as a paymaster at W. Wollen Co., boarding at 44 East Main St.
[S75] Holcombe. Seth P., Phineas Holcomb, Page 36/Item 21. [S25] Hannah McPherson, Holcombe Genealogy, Page 125.1/Item A-8-1-2-6-4-7-8-5. Sarah Almira Searles was born on 7 April 1845 at Hartland, CT. She was the daughter of Russell A. Searles and Lucy Grayson. Sarah Almira Searles married Hubert F. Holcombe, son of Friend Holcombe and Susan Serepta Beach, on 1 March 1868 at New Hartford, Litchfield Co., CT. Sarah Almira Searles died on 27 October 1915 at New Hartford, Litchfield Co., CT, at age 70. She was buried at North Village Cemetery, New Hartford, Litchfield Co., CT.
Eva Clara Holcombe was born on 15 September 1870 at New Hartford, Litchfield Co., CT. She was the daughter of Hubert F. Holcombe and Sarah Almira Searles. Eva Clara Holcombe married Albert Kingman Lovell on 2 June 1905 at New York City, NY. Eva Clara Holcombe died on 16 January 1940 at New Hartford, Litchfield Co., CT, at age 69. She was buried at North Village Cemetery, New Hartford, Litchfield Co., CT.
Albert Kingman Lovell was born on 11 September 1861 at Sandwich, MA. He married Eva Clara Holcombe, daughter of Hubert F. Holcombe and Sarah Almira Searles, on 2 June 1905 at New York City, NY. Albert Kingman Lovell died on 28 January 1935 at New Hartford, Litchfield Co., CT, at age 73. He was buried at North Village Cemetery, New Hartford, Litchfield Co., CT.
Burton Beckwith Holcombe was born in July 1870 at Bloomfield, Hartford Co., CT.2 He was the son of James R. Holcombe and Augusta C. Beckwith. Burton Beckwith Holcombe married Edna Edith Fuller, daughter of George D. Fuller and Josephine Northrop, circa 1896.2 Burton Beckwith Holcombe died on 13 October 1907 at Southern Pines, Moore Co., NC, at age 37. He was buried at Spring Grove Cemetery, Hartford, Hartford Co., CT. There were no children mentioned in his will, there were probably none or at least no surviving children. Burton and Edna were eumerated in the 1900 Hartford, Hartford Co., CT, federal census in the household of George Fuller. He was an electrician, age 29 ; she was 29. There were no children in the household. Widow E. E. was enumerated in the 1910 Hartford, Hartford Co., CT, federal census. She was 38. Also in the household was father George A. 81, and brother George A. 59. Burton Beckwith Holcomb of this city, the well-known automobile driver, died yesterday at Southern Pines, N.C. aged 37 years. He was in poor health for six months and but little hope was entertained of his recovery. Mr. Holcomb was stricken with an attack of pleurisy and a general breaking down in March and physicians advised him to go South as it was though that the climate there would benefit him. He returned to this city in August to attend to some business but after staying a week here his health failed so rapidly that he was hurried back to Southern Pines, his wife accompanying him. Mr. Holcomb's home was at No. 37 Madison street. Relatives of Mr. Holcomb in this city were notifeid of his death yesterday morning. No arrangements were made for the funeral. 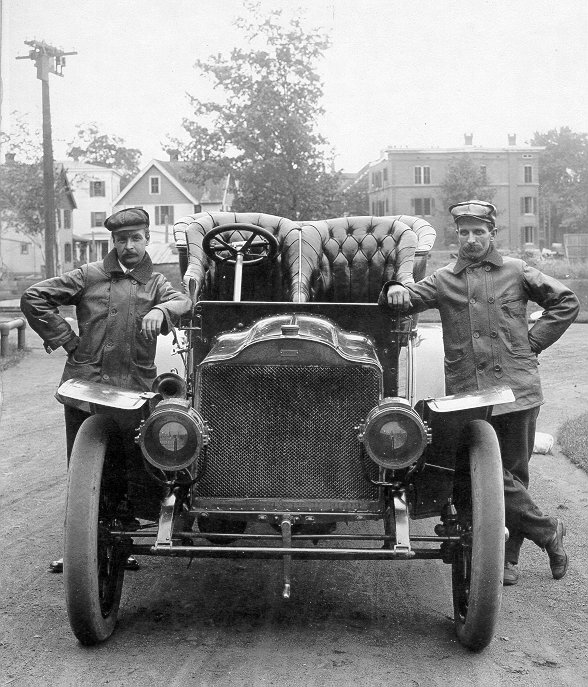 Burt Holcomb drove testing cars for the Electric Vehicle Company for a number of years and he came into prominence when he established the first road record between Chicago and New York in a Columbia car. When his record was broken, he went after it again and mede the distance in 36 hours and 38 minutes. Since then, the record has been lowered by other drivers. He was a very skillful driver and in addition to holding the Chicago and New York record twice he performed a number of other notable driving feats nearer home. The engine in the car that Holcomb drove when he made the Chicago and New York record was known as the "Old Betsy." [S75] Holcombe. Seth P., Phineas Holcomb, Page 38/Item 22. Died before the filing of the birth certificate. daughter Holcombe was born on 22 March 1879 at Bloomfield, Hartford Co., CT. She was the daughter of James R. Holcombe and Phoebe M. Gladwin. Robert James Holcombe was born on 28 August 1880 at Bloomfield, Hartford Co., CT.1 He was the son of James R. Holcombe and Phoebe M. Gladwin. Robert registered for the draft while living at 2 Holcomb St., Hartford, Hartford Co., CT, and listed no place of employment. He listed Edward Barry of Main St., Hartford as his primary contact. Josephine Elvira Dutton was born on 15 July 1841 at Barkhamsted, Litchfield Co., CT. She was the daughter of Jesse Dutton and Jane L. Hawley. Josephine Elvira Dutton married Herman Avery Holcombe, son of Harmon H. Holcombe and Sophronia Avery, on 10 November 1857 at New Hartford, Litchfield Co., CT. Josephine Elvira Dutton died on 11 December 1913 at Barkhamsted, Litchfield Co., CT, at age 72. She was buried at Village Cemetery, New Hartford, Litchfield Co., CT.
Edgar Bronson Holcombe was born on 8 August 1860 at New Hartford, Litchfield Co., CT. He was the son of Herman Avery Holcombe and Josephine Elvira Dutton. Edgar Bronson Holcombe married Susan Roxanna Green, daughter of Lewis Green and Sarah (? ), on 29 December 1889. Edgar Bronson Holcombe died on 6 March 1945 at 49 Sigourney St., Bristol, Hartford Co., CT, at age 84. He was buried at West Cemetery; Sec 1, Lot 201, North part, Bristol, Hartford Co., CT.
Edgar and Susan were enumerated in the 1920 New Britain, Hartford Co., CT, federal census, ED 177, page 15B. He was a carpenter age 59, she was 47. Children in the household were Ethel, 22, Beatrice 12, and Carlton 11. They were enumerated in the 1940 Bristol, Hartford Co., CT, federal census. He was 79, she was 67. Children in the household were Beatrice34, grandson Donald Holcomb 7, and grandson Robert Blackman 18. [S75] Holcombe. Seth P., Phineas Holcomb, Page 39/Item 24. Worthington Eugene Holcombe was born on 23 August 1862 at New Hartford, Litchfield Co., CT. He was the son of Herman Avery Holcombe and Josephine Elvira Dutton. Worthington Eugene Holcombe married Rhetta Mae Pratt, daughter of Edward Judson Pratt and Ella Dutton, on 18 October 1893 at Dutton Homestead, West Hill, New Hartford, Litchfield Co., CT. Worthington Eugene Holcombe died on 13 February 1953 at Nevada City, CA, at age 90. He was buried at San Jacinto Cemetery, Hemet, CA. [S75] Holcombe. Seth P., Phineas Holcomb, Page 40/Item 25. Clifford Howell Holcombe was born on 2 August 1864 at West Hill, New Hartford, CT. He was the son of Herman Avery Holcombe and Josephine Elvira Dutton. Clifford Howell Holcombe died on 2 September 1886 at typhoid, West Hill, New Hartford, CT, at age 22. Burton may have married April 12, 1898 Grace Ethel Palmer. He was probably divorced and may have re-married. He had no children. He was burned to death in a studio in New Rochelle, New York. He had an office at Torrington where he sold music and dealt in photographic supplies and he had gone to New Rochelle to take temporary charge of a studio there. Burton Clark Holcombe was born on 21 January 1867. He was the son of Herman Avery Holcombe and Josephine Elvira Dutton. Burton Clark Holcombe died in 1918 at Burned, New Rochelle, NY. [S75] Holcombe. Seth P., Phineas Holcomb, Page 42/Item 26. Louis and Grace Holcomb were enumerated in the 1910 Colebrook, Litchfield Co., CT, federal census. He was 41, she was 29. Children in the household were Edith Holcomb 10, Gladis Holcomb 8, Barton 4, Alma 3, and Cornelia 10 months. Also in the household were in-laws John and Cornelia Jennings. Louis and grace were recorded in the 1920 Simsbury, Hartford Co., CT federal census, enumeration district 183, page 6A, line 42. He was a laborer age 51, she was 37. Children in the household were Gladys 18, Burton 14, Alma 12, Cornelia 10, Orvis 8, Amiie 6, Hollis 1, and Frederick 10 months. Louis and Grace were enumerated in the 1930 East Granby, Hartford Co., CT federal census, district 112. He was a tobacco farm laborer, age 63, she was 47. Children in the household were Burton 23, Orvis 18, Mortimer 15, Hollis, 12, Frederick 11, Isabel 7, and John, 5. Widower Louis was enumerated in the 1940 Simsbury, Hartford Co., CT, federal census, in the household of daughter Alma Brown, wife of Alvin Brown. Also in the household were Isabelle and John Holcomb, Louis' children. [S75] Holcombe. Seth P., Phineas Holcomb, Page 43/Item 27. Frederick Mortimer Holcombe was born on 6 June 1871 at New Hartford, Litchfield Co., CT. He was the son of Herman Avery Holcombe and Josephine Elvira Dutton. Frederick Mortimer Holcombe married Milly Russell, daughter of John E. Russell and Anna Howard, on 21 October 1897. Frederick Mortimer Holcombe married Nellie Agnes Quirk, daughter of Patrick Quirk and Mary Kenefick, on 21 November 1906. Frederick Mortimer Holcombe died on 7 July 1961 at Granby, Hartford Co., CT, at age 90. He was buried at Center Cemetery, Granby, Hartford Co., CT.
Frederick Mortimer was headman with Culbro Brothers Tobacco. Fred was listed in the 1900 Granby census, page 12B, line 96, as a barber, with wife Milly and daughter Winifred. He was listed in the 1920 Simsbury census, district 182, page 9A, line 48, as the manager of a tobacco farm, with wife "Nellie" and sons Ralph, Fred Jr., and Whitney. Fred M. and Nellie were enumerated in the 1930 Simsbury, Hartford Co., CT, federal census, district 208. He was an agent for Culbro Brothers Tobacco. Children in the household were Harold R. 29, Fred 19, and Whitney, 16. [S75] Holcombe. Seth P., Phineas Holcomb, Page 47/Item 28. Josephine Eliose Holcombe was born on 9 October 1872 at New Hartford, Litchfield Co., CT. She was the daughter of Herman Avery Holcombe and Josephine Elvira Dutton. Josephine Eliose Holcombe married John Edward Gray, son of John Gray and Emily Hall, on 14 June 1892. Josephine Eliose Holcombe died on 4 March 1954 at Torrington, Litchfield Co., CT, at age 81. She was buried at Hillside Cemetery, Torrington, Litchfield Co., CT.
John Edward Gray was born on 2 October 1871 at Derby, VT. He was the son of John Gray and Emily Hall. John Edward Gray married Josephine Eliose Holcombe, daughter of Herman Avery Holcombe and Josephine Elvira Dutton, on 14 June 1892. John Edward Gray died on 19 July 1961 at Kenmore, NY, at age 89. He was buried at Hillside Cemetery, Torrington, Litchfield Co., CT.